With most of Wall Street and the world’s major financial sectors being occupied by protestors and ordinary citizens, who can no longer sit idly by while the global economy is destroyed from within, there could be no better timing for J.C. Chandor’s first feature film, MARGIN CALL, to hit theatres. An all-star cast, ranging from veterans like Kevin Spacey, Demi Moore and Jeremy Irons to relative newbies like Zachary Quinto and Penn Badgly, make this debut a memorable and effective contemplation on what seems more and more like the inevitable collapse of the financial system. 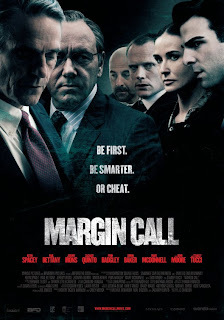 If you’re feeling a little lost about the world’s financial woes at the moment, occupying Margin Call should clear up those last lingering questions for you. hmmmi heard this was kind of slow, but i did like the trailer.